Adam during his presentation for TEDx. Assistant Professor of Audio Engineering Technology Nathan Adam has spent the semester involved in many endeavors outside of the classroom. On November 13, Adam presented at TED Talk at the TEDx Nashville Society of Fellows. 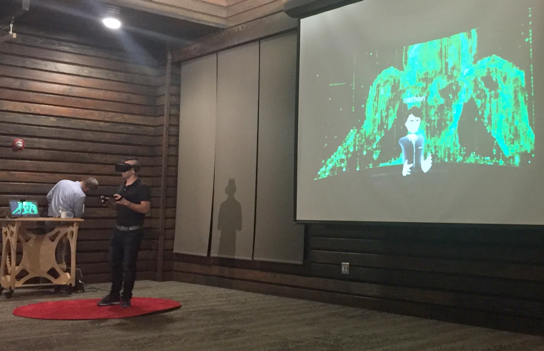 His presentation, “Virtual Reality and the Democratization of Experience,” was presented as an avatar from inside virtual reality. The entire event was themed around discussions of how virtual and augmented reality are going to be one of the most disruptive and transformative technologies of the next 10 years and beyond. Additionally, Adam also coordinated with hit audio software manufacturer Ableton to host a convocation on campus for 50 Belmont students from the Curb College of Entertainment and Music Business. Featuring a presentation and live Q & A, Serafin Sanchez from Ableton demo-ed production workflows and music making techniques in Ableton Live. In partnership with Best Buy Teen Tech Centers, the Boys and Girls Club and the GRAMMY Museum Foundation, Adam coordinated and taught audio engineering for the GRAMMY Camp Weekends in San Antonio, San Diego and Los Angeles. The camps hosted a combined 80+ high school students from the area working in three tracks including audio engineering & electronic music production, video production and songwriting, with instruction from video producers Hadaya Turner and performing artist Laura Donohue. Finally, Adam had the opportunity to host discussion panels for the students alongside GRAMMY winning artists and producers. The camps ended with a 10 song performance featuring all original music and a video created by the students that day.